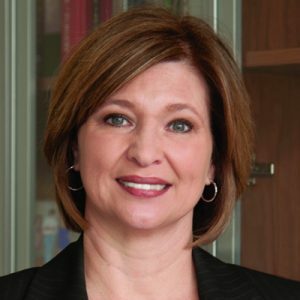 LouAnn Woodward, M.D., FACEP, serves as vice chancellor for health affairs and dean of the School of Medicine, as well as a tenured professor of emergency medicine, at the University of Mississippi Medical Center. She has served on the faculty for nearly 20 years, and has held administrative positions as residency program director, medical director of risk management, assistant and associate dean of academic affairs, interim chief academic officer, interim associate vice chancellor for academic affairs, interim dean of the School of Medicine, associate vice chancellor for health affairs and vice dean of the School of Medicine. Woodward earned her bachelor’s degree in microbiology from Mississippi State University and Doctor of Medicine from the University of Mississippi School of Medicine. She completed her residency and board certification in emergency medicine at UMMC. In the past 10 years, while Woodward has been dean of the School of Medicine, enrollment has increased, student performance measures have improved across the board, and funds have been secured for construction of a new education building. Under her leadership in 2012, the School of Medicine received full accreditation with no areas of noncompliance with the accreditation standards, a first in the school’s 57-year history. As vice chancellor, Woodward’s accomplishments include the full implementation of the first-ever systemwide electronic health record and the establishment of the Myrlie Evers-Williams Institute for the Elimination of Health Disparities. In addition to restoring the Medical Center’s relationship with the Association of American Medical Colleges and, thus, with other academic medical centers, Woodward serves on the Liaison Committee on Medical Education, the accrediting body for medical education programs in the U.S. and Canada. She will serve as chair of the LCME in 2017-18. She has received honors ranging from awards for teaching to recognition as one of Mississippi’s leading businesswomen.